Routine cleaning and maintenance of your organization's server room and data storage facilities are vital to ensuring the safe continuous operation of your school or businesses critical digital assets. Dust and electronic equipment are a recipe for disaster. Dust can clog critical airflow and ventilation components leading to heat issues--resulting in a rise in temperature up to 30 degrees Fahrenheit--and potentially causing data loss and service outages due to hardware failures, which can cost businesses as much as $5,600.00 per minute in lost productivity and sales. [...] the average cost of a single hour of downtime has risen by 25% to 30% [since 2008]. In ITIC’s 2013 – 2014 survey, just three years ago, 95% of respondents indicated that a single hour of downtime cost their company $100,000. However, just over 50% said the cost exceeded $300,000, and only one in 10 enterprises reported hourly downtime costs their firms $1million or more. In ITIC’s latest poll three-in-10 businesses or 33% of survey respondents said that hourly downtime costs top $1 million or even $5 million. Additionally, dust can also contain moisture, which can wreak havoc on sensitive equipment. Further, dust buildup between motherboards and adapter cards can cause connectivity issues and lead to shorts, which can damage equipment or cause communication issues that can be difficult and expensive to diagnose and repair. Complicating the matter--server and network equipment naturally create static electricity that acts a magnet for dust. Increasing the air flow and installing advanced ventilation filtration systems can help, but studies have shown that approximately 80% of the dust brought into the server room comes in on the soles of the shoes of technicians and other visitors. HVAC System/Ducts - Dust buildup in the cooling system can lead to failures and contribute to high heat issues, as well as spread unwanted dust around the server room towards and into the equipment. Ceilings - Ceilings are also magnets for dust, which can be knocked loose by the HVAC system or during cleaning operations, and should be serviced regularly. Additionally, the ceiling void should be vacuumed every six months to eliminate dust and contaminant buildup. Server Racks & Ventilation Systems - Server racks attract dust that can clog built-in ventilation systems, which can lead to heat buildup within the frame and damage sensitive data and network components. Server Exteriors - Regular dusting of server exteriors can help unclog internal air flow vents and prevent heat buildup and equipment damage. Raised Floor Surface Cleaning - Regularly cleaning the raised floor surface can help reduce the buildup of dust, dirt, and other contaminants, as well as prevent the accumulation of static electricity. Depending on the volume of foot traffic in and out of your server room, it may be advisable to vacuum the raised floor daily. Subfloor Plenum Cleaning - The subsurface of the raised floor can accumulate large amounts of dust and clog and damage subfloor airflow systems, or send dust flying up into server racks and equipment. Anti-Static Floor Finishing - Adding an anti-static floor finish after cleaning will help reduce the buildup of static electricity on raised floors and further protect your server room equipment. The use of any other type of equipment presents a risk to the machines. All cleaning service technicians should be adequately trained and vetted to ensure they understand exactly what they will be cleaning, how, and the sensitivity of not only the equipment, but the valuable data they hold. 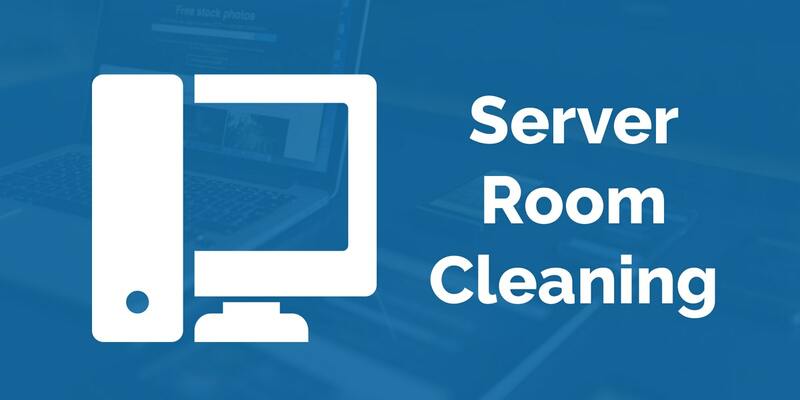 Server room cleaning is a complex and highly technical task that should only be undertaken by experienced and trained service providers to ensure the continuous operation of critical business systems, as well as the security of the data they house. Conventional commercial cleaning equipment is unsuitable for the process and should be replaced with modern green cleaning equipment and antistatic products. If you would like more information regarding the importance of regular cleaning and maintenance programs for your server room and data storage facilities, or would like to discuss the cost-saving advantages to outsourcing your organization's requirements, contact us today for a free quote!